As the California drought enters its fourth year, it is threatening to strangle the splendid irrigation system that transformed the previously desolate Central Valley into some of the world’s most productive farmland and the scruffy Los Angeles Basin into one of the world’s great cities. Faced with potential disasters of this magnitude, one would think that responsible public officials would want to take action to moderate the effects of human-induced climate change. Of course, we can’t say with complete certainty that climate change is the cause of the drought. But public policy is inevitably based on less-than-certain estimates about the future. The best we can do is follow the advice of experts and err on the side of caution. In this case, the overwhelming majority of qualified scientists think that climate change is the culprit, and that there are a variety of practical, reasonably effective measures that can be taken in response. Instead, a widespread reaction, particularly among Republican Party stalwarts, has been to ignore the problem and suppress the evidence. According to an extensive survey conducted by the Union of Concern Scientists, government researchers during the George W. Bush administration were “effectively barred from communicating their findings [about global warming] to the news media and the public.” James Inhofe, Republican Senator from Oklahoma, has written a book entitled "The Great Hoax: How the Global Warming Conspiracy Threatens Your Future" with Republicans in control of the Senate, he has become Chair of the Environment and Public Works Committee. Even more disturbingly, perhaps, large segments of the general public are convinced that this willing ignorance constitutes good public policy. Why are so many people prepared to jump on the denial bandwagon? One answer might be that both officials and citizens cannot face the possibility of nationwide or worldwide disaster. Proponents of global warming, it could be argued, have predicted a future that is just too grim to contemplate. But this can’t be the entire story. In fact, we love to contemplate catastrophe. "Mad Max," "The Hunger Games," "Waterworld," "The Postman," "I Am Legend," "The Walking Dead," and innumerable other books, movies and television series attract large audiences by portraying a future where our society has been devastated by war, disease, environmental calamity or supernatural disaster. Such post-apocalyptic tales constitute an important and widely-popular science fiction genre. One clue to resolving this apparent contradiction is that all these tales feature heroes who fight bravely in the midst of the prevailing circumstances. There is always an identifiable villain to combat. Sometimes that villain is the cause of the disaster; more often, it is someone who has benefitted from the situation. In either case, the hero’s role is to stand up for decency in the face of wickedness that is somehow connected with the overall catastrophe. This suggests that reason for imagining the catastrophe is to clear away the institutional regimentation and humdrum details and modern life, leaving an open field for adventure, resourcefulness and outright aggression. Everything has been simplified, and the complexities of our present life reduced to a direct confrontation between good and evil. Climate change threatens us with a very different disaster scenario and demands a very different response. There is no identifiable villain, just our own failure to recognize a disconcerting but almost inevitable situation. 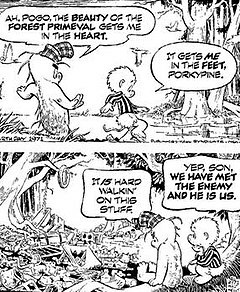 In the famous words of Walt Kelly, “We have met the enemy and he is us.” Nor can we combat the problem with individual, inspiring acts of heroism. What we must do instead is reorganize our daily, humdrum lives. We need to pay strict and scrupulous attention to our carbon footprint. We need to live in smaller houses with solar heating, travel to work on mass transit or by bicycle, reduce our consumption of red meat, wear sweaters in the wintertime and take shorter, cooler showers. Because each individual’s contribution to climate change is infinitesimal, and only collective action will produce results, these behaviors must be viewed as a matter of morality. They must be seen as a new definition of the proper way to live, a set of environmental ethics that has not previously existed. Redefining our sense of right and wrong is always uncomfortable. It is much more pleasant to imagine the entire world in ruins than to recognize that our familiar sense of good behavior has become dilapidated, and needs to be replaced. Edward L. Rubin is a professor at Vanderbilt University Law School. He is the author of “Soul, Self, and Society: The New Morality and the Modern State,” published by Oxford University Press. Edward L Rubin is Professor of Law and Political Science at Vanderbilt University. He is the author of "Soul, Self, and Society: The New Morality and the Modern State" and "The Heatstroke Line," a new novel about the decline of the United States in a future where global warming has taken hold. For more see edwardrubin.com. For more, see edwardrubin.com.